Budgeting 101. The why and how of basic budgeting. If basic personal finance is the first step to financial literacy, budgeting is one of the most basic things we need to learn in personal finance. This is our stepping stone to be financially literate. Most of the Filipinos are not really fan of budgeting. In fact, many of us (including me sometimes) are not aware how money comes in and out in our pocket. We used to have a culture of ‘happy go lucky’ or ‘1 day millionaire‘ where in we spend like there’s no tomorrow. This is true, from a normal Pinoy up to the high earning ones. We take for granted the benefits of budgeting and just easily go with the flow of our financial life. If we are really serious about achieving financial freedom, we should or I say we must be serious in taking steps towards it. We should do something to achieve our financial goals. And one of them is to properly budget our money. I was first exposed in basic budgeting when my mother went to Hongkong to work as a DH. I was in college back then. She sacrificed being far from us to help my father to support our finances, study and other needs. Since I’m the eldest (I have a brother and a sister next to me) my parents agreed that I will be in charge in handling our budget. From food, groceries, bills and our allowances in school it will be send to me monthly. Although my mother already informed me where each peso will go, I’m still trying to figure out how to budget those money effectively and sometimes I became an accountant-wanna-be on how can we save with our expenses too. So I take note how much is for food, groceries, utility bills, allowances and then distribute them individually. As long as we received the money, I immediately divided them in each category we have in our budget. Although I’m not using envelope system at that time (I will share envelope system later), it’s almost the same. I separate each budget for each category and never touch them again until they are paid. That’s my first class and hands on experience in budgeting 101 in real life. Along the road, I learned that budgeting is a journey. Details and applications may differ from each of us but I believe that the concept is the same. And that is to make sure that we properly manage the ‘in and out’ of our money. Let me share you what I learned about budgeting. The Why. Why we need to budget? If you’re thinking that budgeting will make you solve all your financial problem, big NO! If you think that budgeting will make you more money right away, it’s not. If you think budgeting will make you rich quickly, definitely not. Those reasoning and thinking are wrong. Or say too exaggerated. Invest in yourself first. Let’s look at the basic first. I believe that the reason why we need to budget is to make sure we wisely spend our money. To make sure that each peso we spend, counts. To save for ourselves. We budget because we want to control the direction of our hard-earned money. We budget to discipline ourselves. To make sure we are aligned towards our financial goals. And from proper budgeting, we can make better financial decisions that could lead us to financial freedom. This is the true meaning of budgeting for me. It’s not a magic solution to all of our financial problems but a tool in our financial journey that can help us make better decisions along the way. Before you start budgeting your money you need to ask yourself why. Yes! W-H-Y? What is your why? Why do you need to budget? If you don’t have any idea, you can read my reasons above. That is my W-H-Y. We (as in me and my wife) budget because we want to take control of my finances and we want to make sure we are aligned with our financial goals. I’m not an expert. In fact, we fail often in following our budget but as long as we are doing something about it, I believe that we will get there. There could be a lot of adjustments and challenges along the way but we’re ready for it. Budgeting is a process. It’s a life long journey. The How of budgeting. How to budget? After we got married, we talked and agreed on how we will handle our finances (every couple should do this). So as our tradition and most of the Filipino families are doing, my wife handling all of our budget. As we also promised on the church, on our wedding day, she will take care and properly manage all of our finances. Although she is the ‘moneyger‘, all of these things are transparent. We both know how exactly our finances coming in and out. You can read how we handle our finances as newly wed couple here. Before we start budgeting and creating our proper budget plan, on our first month together as mr. and mrs. we agreed to list down all of our expenses. This is what I’m doing before we got married and she definitely agreed on the idea. So we list everything, income, expenses, savings and all of the in and out of our money every peso. After a month, we combined our list together and created several categories. And since we knew how much we spend in each category (from the list we made on the first month) we set a particular amount on that category as a budget. We have something like this. As you can see, next to our income is the savings. We’re following or trying to follow the new formula of the rich, income – savings = expenses. We should immediately pay ourselves first before anything else. Even on the writing, we should do it first. As what they say, when we write things we want in life, our mind will automatically activate million of neurons and will find ways to make it happen. As you can see, we have a budget for all. Even for entertainment or leisure we got that. It’s good to treat ourselves. We should not deprive ourselves, in fact having a budget for leisure or entertainment of ourselves will keep us going in the long run. We’re also giving contribution to each our family as a help and that belongs to our budget. Our financial goal for NOW is to build an emergency fund. We completed our emergency fund, check here. At least 3 to 6 months equivalent to our monthly expenses as the experts advised. We also started to build a fund for our future baby. Yap, we’re starting it now. It’s good to start now than later. After setting a budget for each specific category, we promised to stick to it. But like many other starters, sometimes we fail. We usually fail on budget in food and groceries. But that’s ok, we are working on it. This is what we have right now. And we’re doing some updates regularly. You may have some good idea or budgeting plan but this one works for us, at least for now. We know that along the way we will make changes on our budget as needs and situation could change. If you come reading this far, I am sure you already have an idea how you will create a budget. 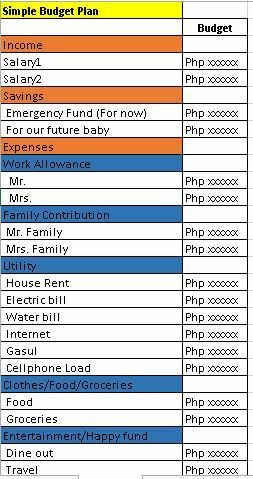 I shared our way of budgeting to give an idea and starting point to others especially to Filipinos and young couple like us. We should really be serious about it. So how do you start? How can you create an effective budget plan for yourself? First step is you need to know how much you spend. You need to know how money come in and out in your pocket. Every single peso. Yes! 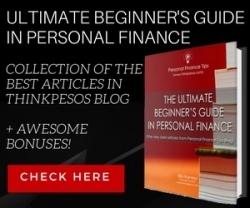 You heard it right, you need to take note every peso you spend. In short, you need to track your expenses. Here are some benefits of tracking your expenses and here are some great tips how to track your expenses. It could be hard at first but you’ll get used to it over time. I’m sure you’ll be surprise once you got the list. Those ‘mini expenses‘ and ‘rarely‘ dine out eat much of your income. 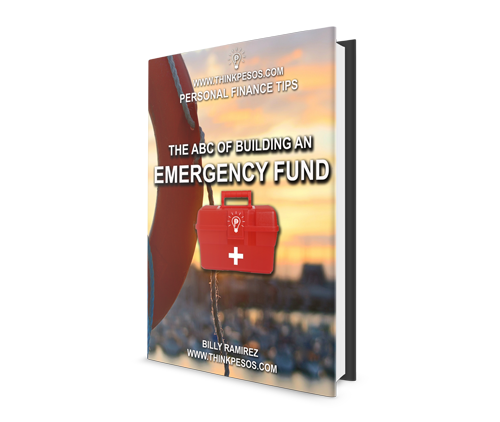 Once you got the list, say for the last month, that will be your basis on your budget plan. You make categories and group them as you want (see our categories above to have an idea). You can create categories or group your expenses in anything you want. Once you have the categories, you will now alot specific amount in each category based from the list of expenses you have on your previous month. That’s why list of expenses is really important when making a budget plan. Be realistic, set amount that you can sustain and fit to your ‘wise expenses‘. List all you income first (income – savings = expenses) then your savings (you should know what you’re saving for) and last your expenses. It is advisable as the expert says to save AT LEAST 10% of your monthly income. This is for your savings. For whatever purpose your savings is (emergency fund, short term financial goals, long term financial goals, investment etc.) you make sure you pay yourself first. Then next goes your expenses. This may vary from each of us but whatever amount you’re comfortable with, please do. It’s better to do it in Microsoft excel (for me). Some people doing it in their smart phones and tablet using apps. See the list of 8 FREE budgeting apps here. Some people are doing it via envelope system (the traditional way). Whatever works for you, go ahead. Once you’ve set budget for each category, don’t touch them. You only spend what is the budget for that category. Discipline yourself. That is the key. It’s given that sometimes or along the way, you will make adjustments. Do so. When the next month came, make an audit or check what happened on the last month’s budget. By doing this, you can identify which category you need to adjust. Don’t adjust the budget for a specific category unless really needed. Then make proper adjustments as needed. Discipline. Discipline. Discipline. You’ll be surprise that you are saving more over time. Not only that, you’ll appreciate every peso you earn, save and spend. You’ll also find more ways to earn and save more pesoses along the way. Please commit to your budgeting plan and do it consistently. That is the key. Do it with discipline CONSISTENTLY. This will be our start. A stepping stone to our financial goals. Let’s achieve financial freedom, one step at a time. You’re welcome Marl. Keep on learning! Godbless! Salamat sa info na hatid ng blog mo. malaking tulong sakin na naghahanap ng headstart sa financial freedom… Malaking tulong talaga.